A member of the Trimdon community has received her second call up to represent her country in the sport of dragon boat racing. 25 year old Rachel Elliott, originally from Trimdon, County Durham moved to St Neots early in 2015 to further her career as an Assistant Clinical Psychologist with the NHS. She joined St Neots Dragon Boat Team in July 2015 primarily as a means of meeting people and enjoying some social exercise. Shortly after joining the club, she got an opportunity to train with the Great Britain National Dragon Boat Team initially as an opportunity to receive some extra training and see what National representation entailed. 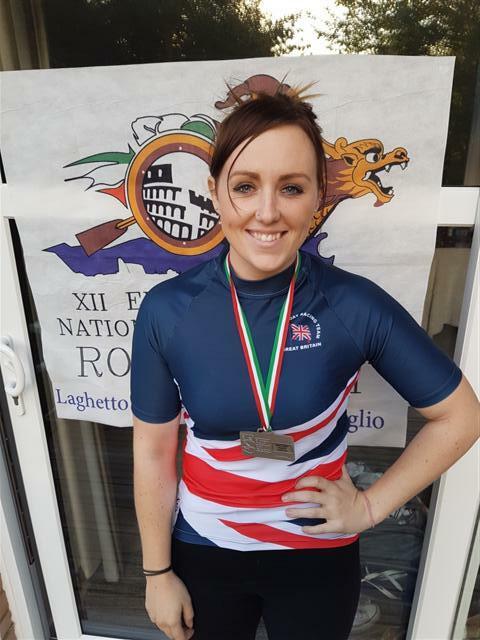 Rachel seized the opportunity and earned a GB call up to the EDBF European Championship squad held in Rome in August 2016 where she won a silver medal in the 500 metres Mixed 10 person boat event. The Great Britain national team were recently invited to attend the IDBF 2nd World Cup in Wujin, China from 19th to 24th October. Rachel is the only Dragon Boat paddler from St Neots to have received an invitation to the squad. Whether you aspire to compete on the national stage, or are just interested in a fun and sociable hobby, the St Neots Dragon Boat Team are always on the lookout for new members of any age, prior experience is not necessary. If you are interested in giving the sport a try, contact us on Facebook, email info@stneotsdbt.co.uk or visit our website: www.stneotsdbt.co.uk for more information.